The crystal ball. Ask your question online for free. First take a deep breath and make your mind clear. Then you can ask the crystal ball : The question must be as the answer is yes or no. Am I going to find true love these days ? Will it rain tomorrow ? Am I wrong when I'm trying to reach the top ? Is the magic ball really reliable ? Do I need to change my job again ? Will I travel this year ? Will I win a free coffee this morning ? 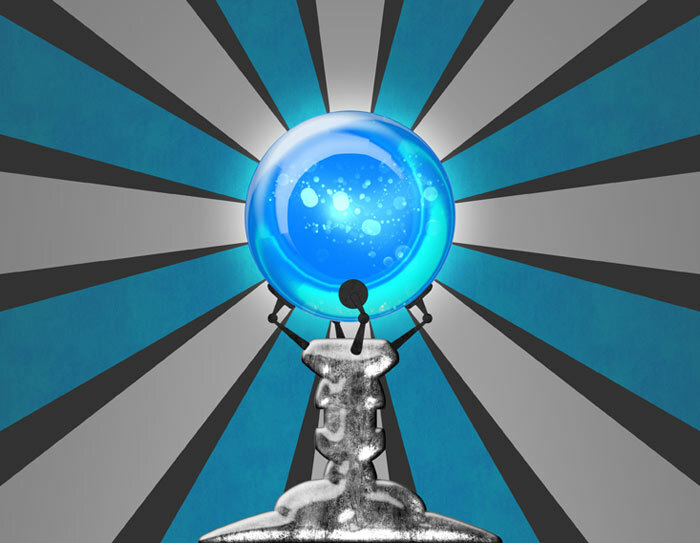 The crystal ball fortune teller is here to give you an answer. The only rule is that your question can be replied by Yes or No. It's coming from the past and it's the future. Ask the chance: You need to concentrate. Your query need to be the only thing you are thinking about. Then you will be ready. We are in 1977, a man named Richard C. has a problem. He has been living in a small village in England (2421 residents) for all his life (he is 34 years old now) and he feels a bit bored. The morning he works with a friend with whom he was at school. Everything is alright, except that they know each other since they are 6 months old and they don't have so much things to talk about. After he eats lunch with his parents. The true is that his mother is one of the best cooker in the world. The afternoon he goes back working with the same guy. In the evening, if he wants a bit of entertainment he can join the only pub in the village. But he already knows everybody there. The last time some strangers came, it was by mistake (they were lost) and it was two years ago. About women it is a worst situation. The most part of them go to the big cities for study and never come back. This means that there is twice more men than women here. And to end this sad story, all the one around 30 years old are already married. So you understand why Richard feel a bit lonely and bored to death. He has never traveled except one time to London. But it was 10 years ago and he stayed just three days there. It was because he was invited at a farmer contest. So the true is that he spent the most part of his time in a huge fake farm made for urban people. It's not the best way to visit this beautiful city. Richard doesn't know what to do and these last months he spent all his time thinking about that. Little by little the idea of living elsewhere keeps going round in his head. But he is afraid. How will he manage it ? He doesn't have money, he is a farmer (A difficult job to find if he lives in a big city). He doesn't know nothing about the rest of the world and he doesn't have any friend living elsewhere than in his village. Richard would like to have an advice, somebody showing him a way, to help him to think and decide. But all his friends and family are living in the small village and they don't know how to resolve this kind of problem. One day he's speaking about this with his brother, Peter, and this guy has an original idea. In the forest lives an old woman who own a crystal ball. The legend says that this object can reply to any kind of questions. What a wonderful idea! The two guys schedule a visit for the next week-end. - Maybe it was not a so good idea. We still can come back at home and drink a hot tea. Richard feels the same, but inside of him cry a little voice, that one that wants some answers. So courageously he begins to walk. 15 minutes later, they arrive to an old house build in wood. They knock at the door and appears an old woman. She is really skinny and has long white hair. She says hello with a deep voice. The two brothers feel a bit intimidated. Richard introduce them and explains his problem. The old lady seems to agree that the crystal ball may be a possible solution. - If you want to ask a question, you have to pay me. I don't need no money now, what I want is just 10 centiliters of your blood. Don't worry about your security, I will use a one shot needle. The request is a bit weird but it seems that the old fortune teller knows what she does so Richard agrees. - Think about your question as it's very clear for you, then make your request. - Do you think that it's in my interest to move from my small village ? - Think your question in another way and try again. This time is free for you. - Do you think that it's going to be fun to travel abroad ? The reply is this time unambiguous: Yes. - I think that you had the answer you was looking for, now please give me your arm, I will take a bit of blood from you. Richard can't sleep this night, he's thinking about what to do. He is not really sure to understand the crystal ball readings. But, suddenly it is like if he is in front of the true and the readings make sens. He was too extreme thinking about going to live in another part of the world. It is more intelligent to first travel and then if he finds a place he likes, he will come back to look for an apartment and a job. His mother was always saying to him 'My son, don't complicate your life', and she was true. Next week he will take seven days of holidays and he will travel to Budapest.